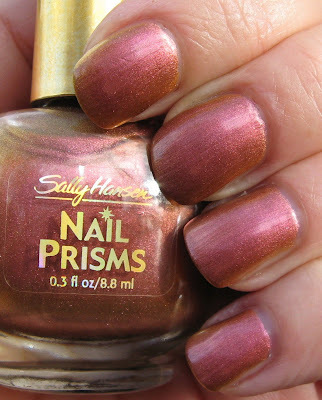 Here are a couple of the Sally Hansen Nail Prisms that I picked up at my local Dollar Tree recently. Both are discontinued, but they have been showing up across the country at Dollar Tree stores. I went back earlier this week to pick some up for one of my readers, and they only had a couple left. 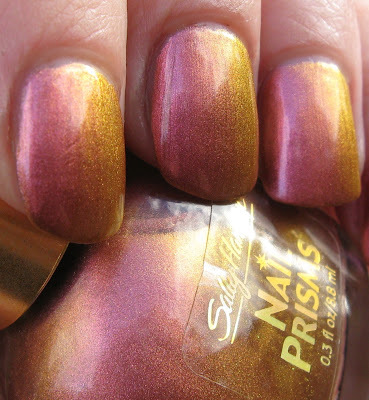 My store now has a large selection of NYC polishes, including Molten Metal. Above & Below: Golden Cinnabar is a deep rose gold shimmer that flashes to a lighter gold shade. I like the strong duo chrome in this, but the shade itself is not my favorite with my skin tone. Below: Lavender Pearl has a less dramatic color change than Golden Cinnabar, going from a pale pinkish lavender tone which is almost white, to a lavender tone. Below: You can see where the word 'pearl' comes into play in this one's name. The finish goes from a shimmer to a pearl when in lower lighting. Below: I know what I'll be doing this weekend! We've had very high winds all week, so there was no point in raking the leaves until that settled down. I think everyone else's leaves blew into my yard! 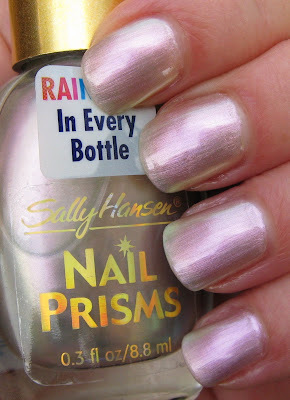 Check out your Dollar Trees to see if they still have any Nail Prisms in stock. They come in 2-packs, so you're only paying $1.00 for two polishes. If you missed out on the NYC Molten Metal craze a couple of years ago, they too could be turning up at your Dollar Tree now. im swapping these with someone but she's taking them to be at a high price :( awww. im feeling the pinch.. I nabbed golden cinnabar yesterday at my local DT, the duochrome is awesome! Golden Cinnabar is one of the ones I found at my DT...I didn't realize how gorgeous it was until right now! These colors look gorgeous on your nails Mary! Especially Golden Cinnabar and Pearl is suich a pretty color. For the leaves, if you have decorations for Halloween, what we did is make scarecrows out of the leaves with over sized sweatshirts and sweat pants. Or they have these giant sized Pumpkin (or ghosts or witches) Leaf bags just for collecting leaves. If you can get the kids, (even the neighborhood kids, many hands make light work) involved it makes for a easy and fun project! Golden Cinnabar is unique, love it! I love Lavander Pearl! It's such a clean, beautiful yet special color! I haven't found any of the nail prisms lately. It's just been LA Colors for awhile. I like the Maybelline's and Sally Hansen's. Golden Cinabar is really gorgeous. I picked up some of these at my Dollar Tree and then went roaming around to other DTs for more. There really aren't that many out there, at least in my area. One strange thing, I got a few duplicates, like 4 Purple Diamonds. But...one of them is holo and the other three aren't! Oh and what I meant was that there weren't that many different shades, but there seems to be a ton of polishes out there. Not just prisms, but many other discontinued Sallys and the NYCs too. I am off to check my Dollar Tree!